Lillian doesn’t always want me to sew for her anymore, but it seems like after I make her something, she loves it. It’s been like that for some time now, so I get a little excited when she asks me to make her something. We actually just chatted about me sewing for her. Originally she wanted to buy all of her winter shirts, but after seeing some of what I made for Owen, I think she now wants me to make her more. I’ve also been trying to let her decide on the fabric that she wants, so that hopefully she’ll like the item even more. I think sometimes she just can’t visualize the pattern in a different fabric than the picture from the listing (or whatever picture I show her) or she doesn’t want to take the time to pick out fabric. She must not be my daughter because I could look at fabric 24/7! For this shirt, we used the same fabric that I previously used for a shirt for Owen. That way they could coordinate; which surprisingly, she still loves. We’ll have to see how long that will last! Hopefully we can get some pics of his soon so I can share those too! The fabric is from Raspberry Creek Fabrics. 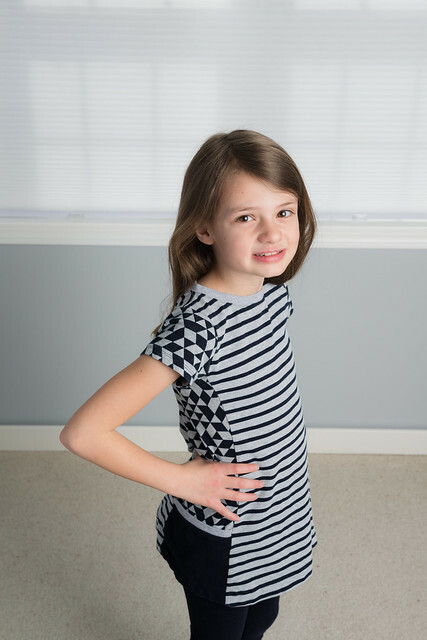 This is the Violet Tunic from Peek-A-Boo Pattern Shop. I resisted getting it for the longest time because I wasn’t sure if she would actually like it. But she does, which is great because I plan on making some long sleeve ones for this winter. 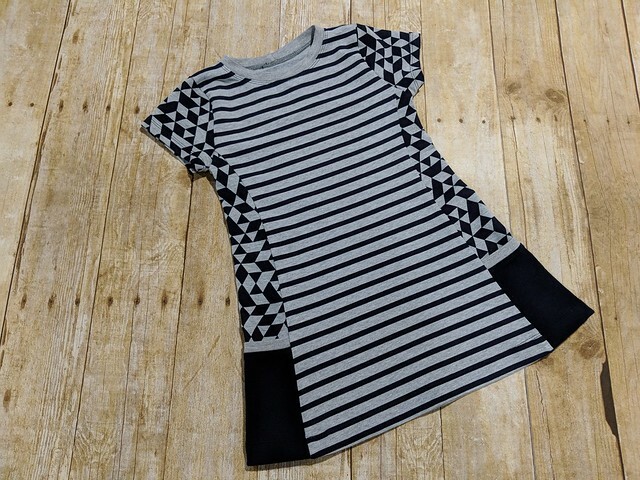 She loves leggings, so tunics are perfect to pair with them. Speaking of leggings! I just remembered that I also made the leggings that she is wearing. 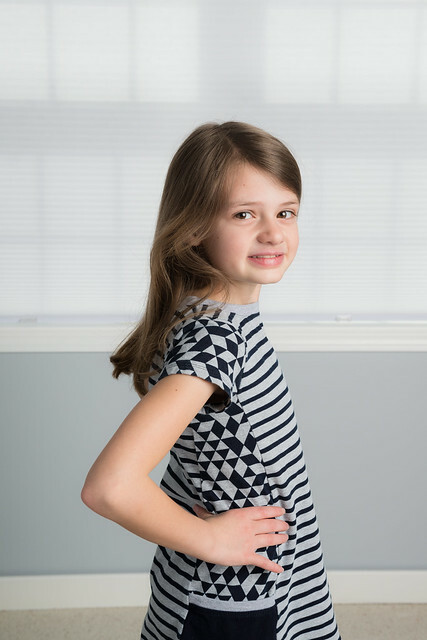 They are the free girl’s Leggin’s Pattern from Love Notions and they run sizes 2T-14. I honestly made these so long ago, that I don’t fully remember much about them. Leggings are pretty easy to make, but I feel like the rise is almost always too high for Lillian. I wish I could recall if I ended up adjusting the rise! I guess I’ll just have to make them again so I can write an actual review for you! One of the things I love about the Violet Tunic is the side panels. They make it really fun to mix and match fabrics. There are so many combinations that you could do to get a different look each time. I used three different fabrics for this one, but you could really use even more fabrics and still make an awesome shirt. Overall, it was easier to sew than it looks. The hardest part is getting the binding on the top of the pockets. You have to stretch a little to make them fit and they seemed to shift every time I started to sew. The only negative to this shirt is that I thought I was making a larger size in order for it to fit longer and it was actually more of a perfect fit instead of slightly big. I’m not sure if I measured Lillian incorrectly or if it was the pattern. Like I mentioned above, I plan on making more of them for her winter wardrobe, so we’ll find out soon. I found a few pictures that I took with my phone to show that she really does wear this more than just for the photoshoot for my blog post. 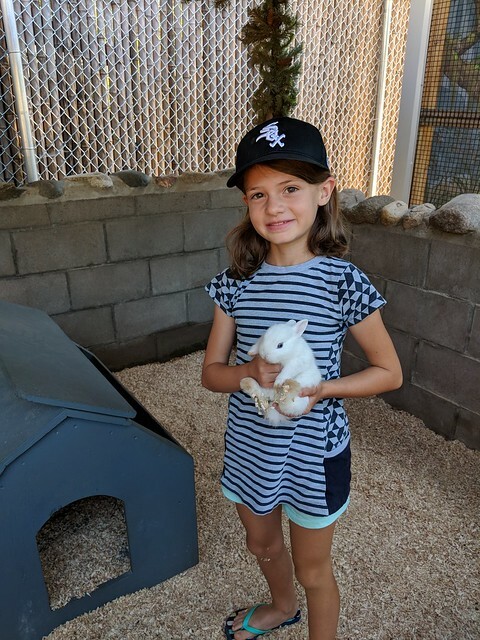 In the above picture, she is holding a bunny at a zoo that is near my in-laws cabin. No, we are not White Sox fans, she couldn’t find her hat, so she wore Owen’s t-ball hat and he just so happened to be on the White Sox team. 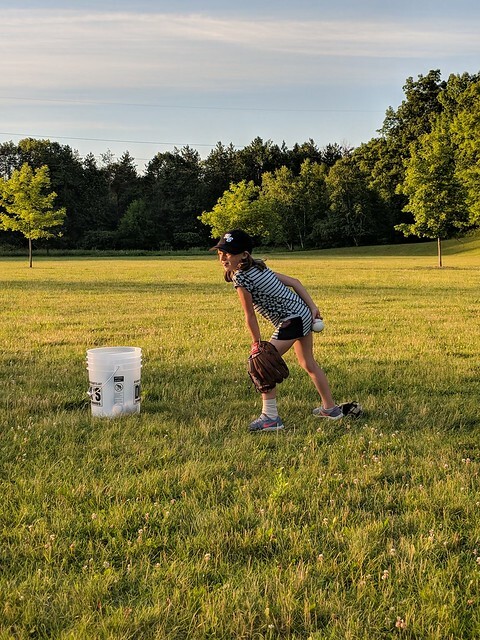 In this picture, she is practicing pitching at a local park. Yes, she has shorts on! I guess that is what I get for making a short sleeve tunic, knowing she is still going to wear it with shorts. A mental note is taken for future makes! I’m honestly just happy that she likes to wear what I make her. Here is a flat lay to hopefully show some of the details of the shirt. Disclaimer: I am an affiliate of Peek-A-Boo Pattern shop and Love Notions so I get compensated for any orders placed through the links in this post.